Kallas, Z.; Escobar, C.; Gil, J.M. Kallas, Zein; Escobar, C.; Gil, J.M. Advertisement impact on consumers’ preferences: a choice experiment approach. A: Workshop on Valuation Methods in Agro-food and Environmental Economics. 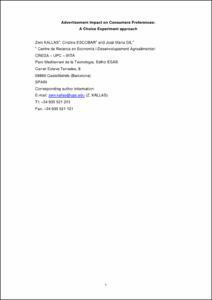 "Proceedings of the IV Workshop on Valuation Methods in Agro-food and Environmental Economics". Barcelona: 2012.